A traditional or oriental rug is a beautiful work of craftsmanship and can add great impact to your home. The history of rug making goes back thousands of years; there’s a rich culture of carpet weaving and flooring textiles in many oriental countries including North Africa, the Middle East, Northern India and Central Asia. Oriental rugs can be very valuable. If you’re lucky enough to have one of these treasures in your home, you need to make sure you look after it properly. Genuine handknotted oriental rugs should last a very long time, as long as you observe some general care and maintenance rules. Roll out your rug on a flat, even hard floor surface. If the surface is slippery or the rug is particularly soft or thin, you may wish to position a pad underneath to prevent the rug from sliding. The pad can be made from rubber, felt, polyester or synthetic foams and should be about an inch smaller than the rug all the way round, so that it doesn’t show. The pad will also cushion the impact between the foot traffic and the hard floor surface below the rug, providing comfort and prolonging the lifespan of your rug. Rug protectors are a personal choice but their use is particularly recommended for old, antique or valuable rugs. It’s a good idea to move your oriental rug now and again to protect it from uneven flooring and possible colour changes. An old or antique rug in particular may fade, its colours bleaching over time due to strong sun exposure. Think about using net curtains to provide sun protection, and turn the rug 180 degrees once a year. When repositioning your oriental rug, rather than yanking at the edge or fringe, wave the edge up and down so that a ripple of air assists in easily moving the rug into its new position. Rugs should be vacuum cleaned regularly on both sides. A dirty rug wears prematurely, which is why regular vacuuming is essential to stop surface dirt filtering down into the pile where it can build up and cause unwanted, increased wear. A plain vacuum nozzle is best – power brushing or power beating may be a good tool for machine made carpets but this method is too strong to be used routinely for the top layer of a delicate oriental rug. Be particularly careful with the fringe which can get caught up and damaged in the rotating mechanism of your upright hoover or power brush attachment. 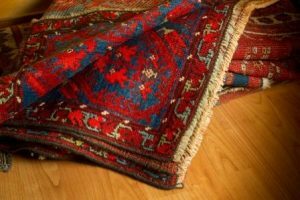 While periodic rug cleaning is recommended, let us issue a word or warning: it is all too easy to damage oriental rugs while cleaning. This is a specialist job that requires the services of a professional rug cleaning company. Here at Apple Clean, we check the composition of your rug and test for colourfastness before we do anything else. We only use gentle, environmentally friendly cleaning products that are guaranteed 100% safe. We have specialist products for the effective cleaning of fringes and edges. And of course we can remove harmful bacteria and dust mites, leaving your rug hygienically clean and smelling fresh. Your rug will be dry within hours and we can professionally apply Scotchgard protection if required. Finally, in order to derive years of enjoyment from your oriental rug, you need to watch out for signs of damage, some of which may be serious and require professional help. Common problems can include pet damage (scratching, chewing, staining), sun damage, wear and tear, vacuum cleaner damage, water damage, moth damage and chemical damage. Every effort should be made to control your pets so that no harm can be inflicted on your precious rug. Pot plants should never be placed directly on a rug in case of damp causing spoiling the pile and foundation of the rug. Damage caused by moths and their larvae can be extensive and expensive to remedy, but small areas of damage are relatively straight forward to repair if caught early. Moth balls and cedar scent – routinely used for clothes moths – are ineffectual for rugs. Instead, it is advisable to ask for professional advice in order to choose the most suitable insecticide and guidance on how to tackle the problem safely.